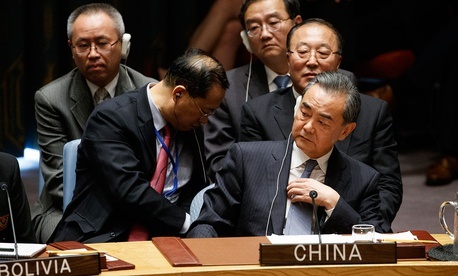 With Chinese Foreign Minister Wang Yi sitting nearby during a U.S.-chaired session of the United Nations Security Council, the American president explained that the Chinese “do not want me or us to win, because I am the first president ever to challenge China on trade, and we are winning on trade, we are winning at every level. We don’t want them to meddle or interfere in our upcoming election.” Trump did not elaborate on his government’s findings regarding China’s alleged attempted interference. Wang seemed to literally shrug off Trump’s charges, asserting later in the session that China’s long-standing policy is to not interfere in the domestic affairs of other countries. Trump reserved most of his ire for Iran during his opening statement, and even spoke warmly of his collaboration with Chinese President Xi Jinping in addressing North Korea’s nuclear-weapons program. But the confrontation between Trump and Wang was in keeping with one of the deepest-running and most disruptive themes of this year’s UN General Assembly: the increasingly pitched rivalry between the world’s two superpowers. A day earlier, in welcoming the world’s leaders to the UN General Assembly, UN Secretary-General António Guterres had warned of the hazards of shifting international power dynamics, citing the political scientist Graham Allison’s theory that war between China and the United States, as with other rising and ruling powers throughout history, is distinctly possible but not inevitable. The other big story of the year at the UN, of course, is Donald Trump, who has once again, in the words of Stewart Patrick of the Council on Foreign Relations, come to the General Assembly and played the role of the “America-First bull in the globalist china shop.” Or is it the globalist China shop?